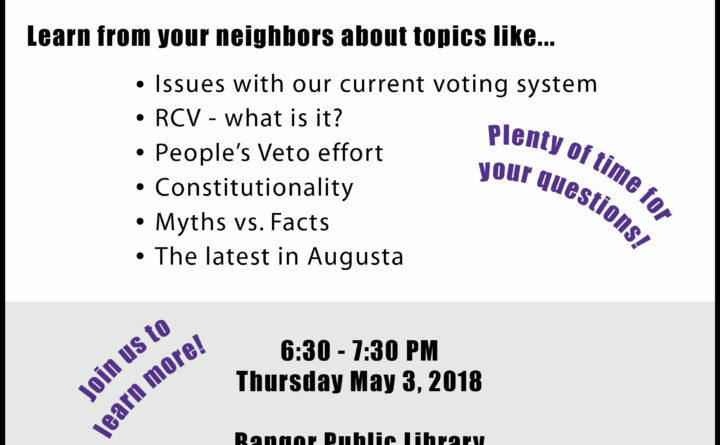 BANGOR — There will be a public forum on Ranked Choice Voting, which will be used in our upcoming June primary elections, at 6:30 p.m. Thursday, May 3, in the Lecture Hall at the Bangor Public Library. This is hosted by local members of the Committee for Ranked Choice Voting. Topics will include: What Ranked Choice Voting Is And How It Works; Issues With The Current Plurality Voting System; The People’s Veto Referendum To Permanently Restore Ranked Choice Voting; The Constitutionality Issue; Myths And Misconceptions About Ranked Choice Voting. This is a free event open to the public. Anyone may attend.